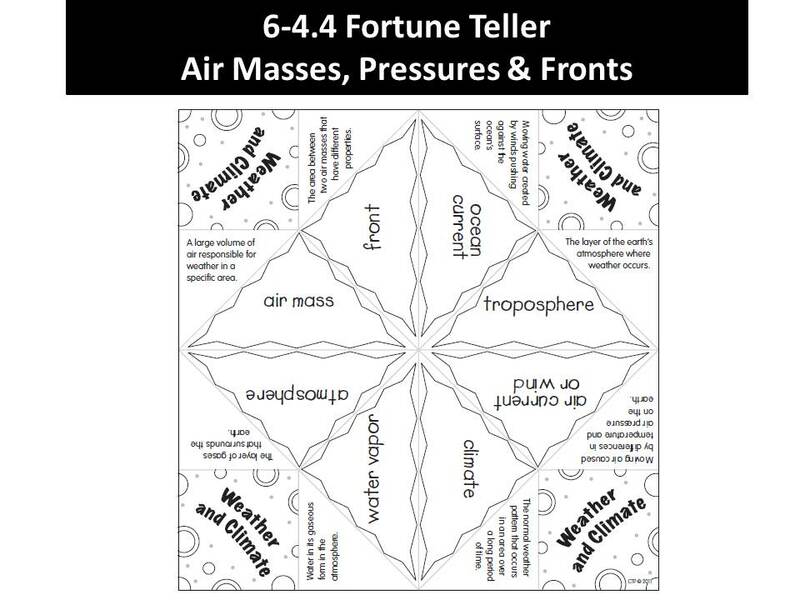 6.E.2B.2 Develop and use models to explain how relationships between the movement and interactions of air masses, high and low pressure systems, and frontal boundaries result in weather conditions and storms (including thunderstorms, hurricanes and tornadoes). • Huge bodies of air that form over water or land in tropical or polar regions. • Temperature and humidity conditions (for example, warm or cold air, humid or dry air) within the air masses as they form are important to the resulting weather conditions when air masses move. • As these air masses move and collide with each other, fronts form at the boundaries between the air masses. • Depending upon the air masses involved, a warm front, cold front, stationary front, or occluded front can develop. o When a warm air mass collides and rides over a cold air mass, the resulting warm front may produce long periods of precipitation and warmer temperatures. o When a cold air mass collides and slides under a warm air mass, the resulting cold front may produce thunderstorms and sometimes tornadoes and cooler temperatures. o When neither a cold air mass nor a warm air mass moves at a frontal boundary, the resulting stationary front may produce long period of precipitation. o When a cold air mass pushes into a warm air mass that is behind a cool air mass, the warm air mass is pushed up above the cooler air masses. The resulting occluded front may produce long periods of precipitation. • Warm air rising or cold air sinking combined with the spinning of the Earth causes the air to spin forming high and low pressure regions. o High pressure systems usually signal more fair weather with winds circulating around the system in a clockwise direction. o Low pressure systems with counterclockwise circulating winds often result in rainy and/or stormy weather conditions. • Severe weather conditions called storms occur when pressure differences cause rapid air movement. • Conditions that bring one kind of storm can also cause other kinds of storms in the same area. o Thunderstorm is a storm with thunder, lightning, heavy rains and strong winds; form within large cumulonimbus clouds; usually form along a cold front but can form within an air mass. ​o Tornado is a rapidly whirling, funnel-shaped cloud that extends down from a storm cloud; the very low pressure and strong winds can cause great damage to people and property; are likely to form within the frontal regions where strong thunderstorms are also present. o Hurricane is a low pressure tropical storm that forms over warm ocean water; winds form a spinning circular pattern around the center, or eye, of the storm; the lower the air pressure at the center, the faster the winds blow toward the center of the storm. How Air Pressure Affects You!